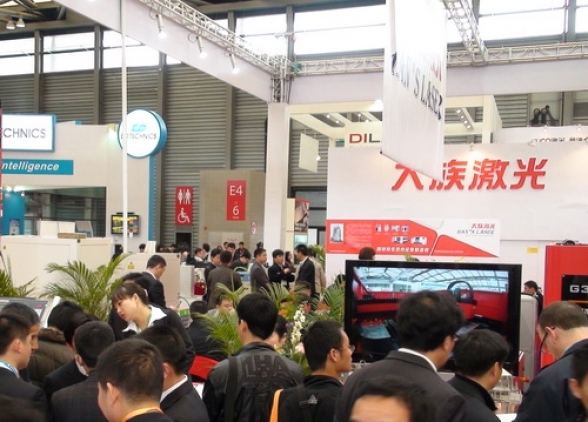 2011 March 15 - 17, Han's Laser took part in the LASER World of PHOTONICS CHINA which opened in Shanghai, it's a China's platform for the photonics community, features a superior show concept for exhibitors and visitors. Han's Laser exhibitted their Own developed latest Laser Marking Machine, Laser Welding Machine, Laser Cutting Machine & New high-power laser cutting machines and other products, Our booth attracted so many laser equipment buyers's eyeball, consulting firms steady stream of personnel related products. Due to the continuous upswing within China's laser technology industry, LASER World of PHOTONICS CHINA closed with record-breaking figures in Shanghai. With this positive climate serving as the background, a total of 361 companies from 18 countries participated in the fifth LASER World of PHOTONICS CHINA trade show, which took place at the Shanghai New International Expo Centre (SNIEC) from March 15 - 17, 2011. Exhibitors as well as visitors used the collocated electronica & Productronica China, SEMICON China and CPCA events to pave the way for business deals. The 28,845 trade visitors who attended the show exceeded the organizers' expectations. Exhibiting companies included market leaders such as Coherent, GSI, Han's Laser, IPG Laser, Jenoptik, LINOS / Qioptiq, nLight, Spectra Physics/Newport, Rofin and Trumpf; Germany was represented with a national pavilion.